Back Office Pro’s team of highly experience analysts, provides proven outsourcing models to meet your business intelligence and analytics needs. Over the years, we’ve become a trusted partner and advisor to businesses around the globe, building extremely competitive intellectual property. We take pride in our ability to harness a wide range of capabilities ranging from data analysis and architecture all the way through to highly advanced forecasting and decision-making support. In order to thrive in the modern business world, firms need on-demand intelligence and improved analytics to foster better decision-making processes. By leveraging BI platforms to maximize efficiency, BOP offers the support businesses need to boost their productivity and profitability. Bachelor’s degree, or foreign equivalent, in Electronic Engineering, Business, or related fields. A minimum of two years-worth of on-the-ground experience in business intelligence research or similar. Experience in the use of front-end reporting tools, including SAP Business Objects-Webi, SAP Business Objects Information Design Tools, and Power BI. Well-versed in the use of databases (Microsoft SQL, Oracle, or equivalent). Highly experienced in the use of programming languages including T-SQL, MDX/DAX, ABAP. Well-versed in the use of popular, industry-related software including SAP ERP (ECC) and JIRA or an equivalent ticket management system. Advanced knowledge in Microsoft Office Suite, particularly Microsoft Excel and Microsoft Access. BI Operations Support Our teams provide system support according to a pre-defined SLA. Additionally, we are experts at automating monitoring processes and resolving any issues identified by business users. Master Data Management Solutions Our MDM solutions involve the creation of consistent definitions of business entities via integration techniques across multiple internal IT systems. Spot Consulting At BOP, we take pride in our ability to develop technical solutions according to the customer’s list of unique requirements and specifications. Our spot consulting services include functional testing and customer support during UAT and go-live. BI Solution Audit We help you take a closer look at your current BI solution, assessing scalability and adherence to the latest industry standards and practices. Saving you money - BOP’s teams help to solve the problem of standardization and economies of scale thus guaranteeing significant cost savings. Making the most of data - We are extremely capable of translating simple data into actionable steps, setting a solid foundation for your business processes. Expertly trained, highly knowledgeable resources - We find the right resources for your project, rapidly delivering business value from your BI initiatives without having to worry about training new staff. Amazing technical capabilities - BOP’s teams offer vast expertise with a variety of well and lesser-known BI tools and technologies. 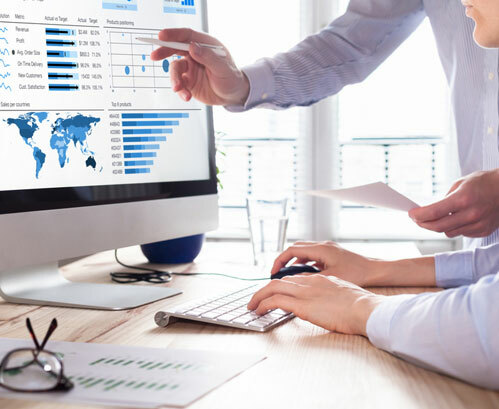 Make better strategic decisions - We are extremely skilled at translating BI reports into informative insights for major decision-makers and stakeholders. Let Back Office Pro’s BI experts help you set up your business for success. Our researchers and analysts have amassed a wealth of experience between them and are ready to tackle your project at a moment’s notice. Contact us via our online form and we’ll get back to you within one business day.